Today sees the launch of the new CFI / CRAOL series ‘On the Cusp- Belonging to Ireland’, a joint venture between 7 community stations, working with members of the travelling, immigrant, LGBT and former offender communities. The event today also includes an award ceremony for participants in the QQi L3 media expression course that have completed their training with the stations. The course had more than 60 participants from diverse groups across the country, and placed a special emphasis on advocating for change through media. The course was run free of charge to participants and was funded by the Community Foundation of Ireland. Topics covered in the show include the asylum process, addiction and homelessness, discrimination and the referendum on changing the voting age to 16.. The programme makers spoke to members of the public, industry professionals Vincent Browne professor Des McCaffrey, as well as TD’s Ciaran Cannon. 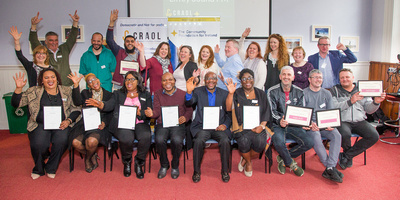 This ground-breaking project, spear-headed by Craol – The Community Radio Forum of Ireland and funded by The Community Foundation for Ireland, seeks to remove the obstacles that prevent people’s voices from reaching the airwaves on the issues that concern them. The project, designed and coordinated by Craol, has facilitated the training of more than 60 people to become advocates and media-producers. These new community radio makers have gone on to produce over 7 hours of radio that tackles directly the issues concerning them, and their communities. In a poignant reminder of how some of these marginalised communities are suffering, the audience heard of the plight of one participant Barry, from Limerick who completed the course while residing in Direct provision. Just days before the certificates were to be awarded, Barry was notified that after 10 years of living in Ireland, his asylum application has been rejected and he will shortly return to his native Guinea. The Limerick Leader gave a feature to the group from Limerick can be found here which includes Barry and the rest of the participants while they were undertaking the course. Commenting on Barry’s plight, Tina Roche said that it highlighted the urgent need for reform of the direct provision system. You can find out more about the project and hear all 7 local programmes, along with the National Series at www.craol.ie.